We have discussed in our earlier posts on how to setup Delivery date from Order Delivery Date Pro for WooCommerce plugin. Now we will discuss on how you can setup Delivery Time along with Delivery Date from the plugin. the time slot from the set fixed time slots. In this post, we will discuss on how to setup time range. Let’s take an example of some business like Cakeshop, Gift shop, Grocery shop, etc who want the customers to select their preferred time between the working hours. So they can use the Time range settings from the plugin. You can find this setting on Order Delivery Date -> Settings -> General Settings -> Time Settings link. To enable the time selection on the checkout page you first need to enable the Enable delivery time capture checkbox. After enabling the time selection you need to set the start hours and the end hours for the time sliders. So for example, if your working hours are from 9 Am and close at 6 Pm then you can set the start time as 9 and end time as 7. You need to select the timings in 24 hours format. 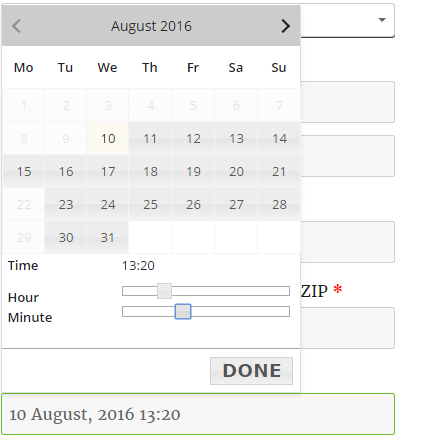 Once the time range is set, users will be able to select the preferred time from the time sliders on Checkout Page. The minute slider interval defaults to 5 minutes. So if you have a business where you want your customers to choose their preferred time along with delivery date then you can this feature.